G.A. Bartick is President of OutSell, which trains 25,000 salespeople each year. A former executive at Nordstrom, he is also a national speaker and facilitator at conventions and meetings around the country. He has developed and implemented sales programs for Morgan Stanley, Wachovia, Charter Communications, and Oakley, among others. Paul Bartick is a Director at OutSell who has published dozens of articles in periodicals and newsletters on implementing the Silver Bullet Selling sales process. He has created customized content for hundreds of Silver Bullet Selling programs for clients such as Bank of America, Time Warner, Transamerica, and DIRECTV. Foreword by Michael St. Lawrence. PART ONE: THIS IS SILVER BULLET SELLING. Chapter One: You Don’t Have to Be a Natural-Born Salesman. Chapter Two: I’m a Salesman and This Is My Story. Changing Lives Six Steps at a Time. Chapter Three: Why You’ve Got to Read This Book. 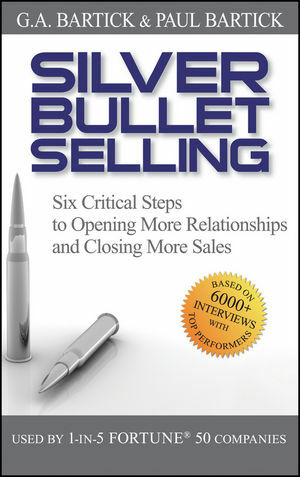 The Six-Step Silver Bullet Selling Process. Chapter Four: Why a Sales Process? The Gift of Gab Doesn’t Necessarily Translate into Sales Commissions. Lowering Resistance and Raising Receptivity. In Sales, Communication Is King. Chapter Five: What Is This Bullet Selling Process, Anyway? The Six Steps: An Overview. Great Sales: One Part Process, One Part Personality. A Little More Effectiveness Leads to Dramatic Results. PART TWO: SIX-STEP BULLET SELLING PROCESS. Chapter Six: Pre-Call Planning Overview. The Importance of a Quiet Mind. Chapter Seven: What Pre-Call Planning Really Means. Pre-Call Planning Definitely Means Appearance. Getting There on Time Is Pre-Call Planning. Pre-Call Planning in Team Selling Situations: The 10 Key Issues. Getting the Names Right Is Pre-Call Planning. Pre-Call Planning Is Ironing Your Briefcase. Chapter Eight: Pre-Call Planning Checklists. Chapter Nine: Building Rapport Overview. Chapter Ten: Preliminary Pleasantries and the Agenda Statement. Preliminary Pleasantries Start the Ball Rolling. Transitioning to the Business Conversation. Begin Every Meeting with an Agenda Statement. Serving Up a Million-Dollar Loan at Mickey D’s. Chapter Eleven: Building Rapport by Playing the Credibility Card. Positive Effects of a Credibility Statement. Three Questions on Every Buyer’s Mind. Discovery Is More than Fact Finding. Listening to Understand versus Listening to Respond. Chapter Thirteen: The Goals of Discovery. Listening Is the Gateway to Rapport. Chapter Fourteen: Tools You Need to Accomplish the Goals of Discovery. Chapter Fifteen: You’re Only as Smart as the Questions You Ask. Asking Questions Is Not an Interrogation. You Know What Happens When You Assume . . . .
Discovering Where the Emotional Criterion Is Hiding. What If You Sell Boring Products? Chapter Sixteen: The Discovery Summary: So Important, It Gets Its Own Chapter. Discovery Summary: Taking Discovery to the Next Level. A Few Choice Words about Sales Cycles. Chapter Seventeen: Tailored Solution Overview. The Solution Presentation: Not Your Father’s Sales Presentation. Chapter Eighteen: Your Solution Presentation Agenda Statement. Begin the Solution Presentation with an Agenda Statement. Chapter Nineteen: Your Business Philosophy. How Do You Compete? Figuring Out Your Competitive Advantage. Chapter Twenty: Presenting the Details of Your Solution. Presenting the Details of the Deal. Linking FBBs to What You Learned in Discovery. Trial Close: Testing for Buyer Reaction. Put Passion into Your Solution Presentation. Chapter Twenty-One: Addressing Concerns Overview. Two Secrets You’ve Got to Know before Addressing Any Concerns. Two Situations We Don’t Want to Get Into. How the Real Pros Do It. Chapter Twenty-Two: Executing the Addressing Concerns Process. The Six-Step Addressing Concerns Process. The Process Is Not Bulletproof. Transitioning to the Addressing Concerns Process with a Trial Close. The Four Types of Buyers. Chapter Twenty-Three: Responding to Concerns. Three Ways to Respond to the Cost Concern. Addressing Concerns Other than Cost. Using the Addressing Concerns Process at Home. Chapter Twenty-Four: Vaccinating the Buyer against the Competition. Step Six Closing the Sale. Chapter Twenty-Five: Closing the Sale Overview. Chapter Twenty-Six: What Closing Is All About. Closing Is a Process, Not an Event. Closing Rewards the Persistent: A Lesson from Dr. Seuss. Chapter Twenty-Seven: Closing the Sale: Firming Up Details and Setting Expectations. Asking for the Order Is Closing. More Bullets for Your Chamber. APPENDIX: OutSell Consulting: “Our Business Is Your Business”.